Combine two of London’s top experiences with an entrance ticket to St Paul’s Cathedral and a Thames River sightseeing cruise. With your 24-hour cruise pass, you can hop on or hop off your boat at three conveniently located piers. See iconic London sights like the Houses of Parliament and the London Eye from the water, and then pay a visit to St Paul’s Cathedral. Admire the elaborate beauty of the cathedral floor, see the tombs of historic figures in the crypt, and ascend to the Golden Gallery for spectacular views. With your 24-hour hop-on hop-off cruise pass, board your boat at one of the following conveniently located piers — Tower Pier, Greenwich Pier or Westminster Pier. 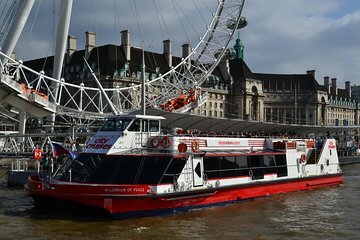 From the water, you’ll enjoy an alternative perspective of top London attractions such as the Houses of Parliament, the London Eye and Westminster Abbey. Cruises depart every 30 minutes from the pier of your choice, allowing you to hop on and hop off whenever an attraction captures your attention. Glide beneath the iconic Tower Bridge and see, too, the Tate Modern, County Hall, the Cutty Sark, Southward Cathedral, in addition to many more famous monuments. During your cruise, opt to purchase refreshments from an onboard bar and ascend to the upper deck to capture fantastic photographs. Before or after your cruise, head to St Paul’s Cathedral — the limestone landmark designed by Sir Christopher Wren — and present your entrance ticket on arrival. Marvel at the elaborate decoration of the cathedral’s interior, adorned with prismatic paintings and intricate sculptures, before admiring the tombs of historic figures in the crypt. Then, venture upwards to the Whispering Gallery — so called because whispers can be heard clearly 100 feet (30 meters) away — and then conquer a further 271 steps to the Golden Gallery, from which spectacular city views can be enjoyed. 2 hours is sufficient time to explore St Paul’s, but feel free to stay longer if you feel the need. Great way to see the River on your own schedule however closest stop to St Paul's is the Tower of London . That is s bit of a hike for older adults or a cab ride to get to the Cathedral.There are only 4 stops on the cruise but you can ride the boat all day or hop on /off. We have fabulous pictures from the boat including unbelievable sunset pictures . The only downside is if you want to spend time in Greenwich, you might need to run through St Paul's or forego it . We did take the boat out to Greenwich but as the return trip to London is between 5 and 6 pm we did not get to see the town . I would do the cruise again with this company as they have an open top deck and not all of the cruise companies do, just do St Paul's on a separate day if you want to see Greenwich. It's good and worth the visit. Really loved this tour, and I recommend to take the long version of it once you reach. You will have the option to take a short and longer tour. It's a place filled with history and you would want to know as many stories as you can. It makes the tour more interesting and enjoyable. Very exciting especially with sunny weather !